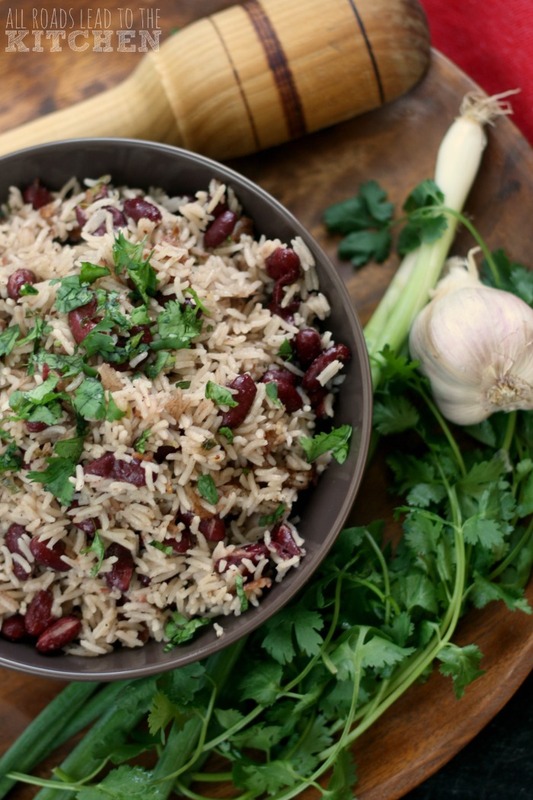 This month's Progressive Eats menu celebrates the foods of the Caribbean. Aaaaah, the Caribbean...home of all sorts of places that I long to visit, but probably never will. Unless I win the lottery that I usually forget to play. But that doesn't mean a girl can't armchair-deskchair-kitchentable travel! 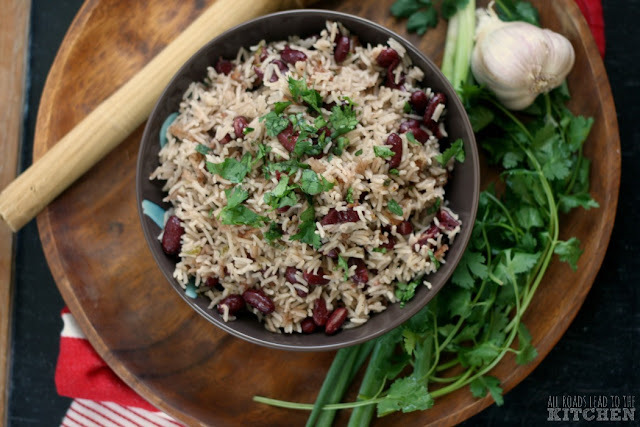 Even though there are all sorts of wonderful ingredients and dishes I could have chose from, due to last-minute-itis, I kept it simple and made a Jamaican staple, red beans and coconut rice. This dish may look unassuming, but since it is simmered in coconut milk and infused with the heat of a Scotch Bonnet chile, it is both rich and nuanced, as well. I'm pretty sure that this traditional dish, along with the other amazing food on our Progressive Eats menu (check it out after the recipe) would transport me to the Caribbean,...if only for a few moments. I'll take it. This vegan Jamaican dish is enriched with coconut milk and infused with a little Scotch Bonnet heat. Makes a delicious side dish or main course. Set a deep-sided skillet over medium heat and add oil. Once hot, add garlic and scallions, stirring, until just soft, ~2 minutes. Make a slit in the chile with a sharp knife and add to the pot along with the beans and 1 cup of the coconut milk. Bring to a simmer and allow to cook, stirring occasionally, until thickened, 6-8 minutes. Add the rice, the remaining cup of coconut milk, and a big pinch of both salt and pepper to the pan; bring to a simmer. Cover, reduce heat as low as it will go, and cook until rice is tender, about 20 minutes. Taste and adjust seasoning as needed. Sprinkle with cilantro and serve. If you can't find a Scotch Bonnet chile, substitute something similar like a Habañero. You could also use a dried Scotch Bonnet or a big pinch (or more) of Scotch Bonnet chile powder. Welcome to Progressive Eats, our virtual version of a Progressive Dinner Party. This month we're featuring dishes native to or inspired by the islands of the Caribbean. Our event is hosted by Coleen who blogs at The Redhead Baker. Our dishes this month are inspired by the cuisines of Jamaica, Cuba, The Bahamas and more. You'll certainly find a delicious recipe to add to your repertoire!